Recent years have seen the construction of an entire district around the former district and regional court. The new district was formally opened last autumn. The interaction between the planned new buildings with the existing ones, some of which are listed as historical monuments, posed a special challenge to the urban planners. One example of such a challenge is the ‘Lifestyle’ office building that stands on the corner of Ratinger Strasse / Neubrückstrasse. Its unusual architecture is dominated by white architectural concrete elements that contrast with the listed façade of the former Palais Spinrath. 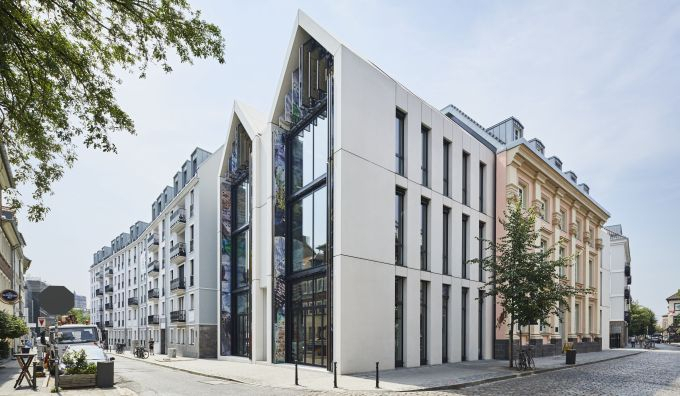 The design by the architectural firm of slapa oberholz pszczulny (SOP Architekten), which is based in Düsseldorf, aimed to achieve a very monumental yet filigree style. The new building extends the former palace's existing façade to both sides and allows it to flow into the fully glazed double gables. The precast concrete elements adjoining the gable sides were manufactured in up to three phases of production in order to satisfy the architect's wish to achieve a seamless transition. Hering Architectural Concrete supplied and installed a total of 168 elements, which were installed from the classic curtain wall to right into the roof areas. The slender six-centimetre-wide roof elements were reinforced with stainless steel mats and fitted to the pitched roofs using a special structure built from stainless-steel consoles.